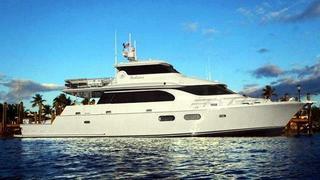 Mike McCarthy at HMY Yacht Sales sends me more information on his central listing, the 25.9m motor yacht Andiamo. Built by Taiwan's Symbol Yachts in 2010, she was conceived by naval architect Jack Sarin as a family yacht with full fishing and diving capabilities. A satin-finished cherrywood interior offset by off-white carpeting accommodates six guests in a master suite, VIP stateroom and a twin cabin while twin 1800hp MTU engines power Andiamo to a cruising speed of 16 knots. On display at the Fort Lauderdale show, Andiamo is asking $4.7 million.